Iris System Monitor (ISM) now checks V1 and V2 platform versions! We have made the Iris System Monitor even better! The Iris Users Iris System Monitor (ISM) now checks for the latest platform versions and monitors even more Iris V2 services. Our Iris status tool is built upon a proven, cloud-based monitoring solution. The Iris System Monitor checks all Iris services every 5 minutes then reports on the last 5 events for each service. The next time an Iris outage hits, check the Iris System Monitor for a complete summary of the system status first! Save Instant Pack Film – You can help! Long before there was Home Automation, before computers connected the world, and digital cameras lived in everyone’s pocket, there was the Polaroid Instant pack film camera, an innovation released to the world over 50 years ago. It’s hard to escape the realization that world is a much different place than it was 50 years ago; it was a time when instant gratification had a uniquely different meaning. It was a time when instant photography was not about Instagram, it was about the anticipation of waiting for the a new memory to develop, quite literally in front of your eyes. Not the Polaroid you grew up with…. Chances are back in the day you or someone you knew owned a Polaroid camera, but was kind was it? For many the name Polaroid brings to mind the plastic, instant prints with the large white border at the bottom, a technology known as Integral film. However, peel-apart pack film is a much different animal which brings a more realistic photographic quality that is as close to a lab developed photographic print as one can get with an instant camera. The end result is a glossy, paper photograph that is virtually indistinguishable from a print made in a photo lab. Even with the demise of Polaroid’s film business in the late 2000’s, FujiFilm, based in Japan continued to carry the torch by producing a wide variety of commercial pack films. Over the years, one-by-one, Fuji has quietly pared down the line of pack films until the last one, Fujifilm FP-100C remained. That has all changed… Fuji has recently announced that all pack film production will cease, leaving millions of cameras destined for landfills while bringing instant photography one step closer to the history books. Florian “Doc” Kaps, the founder of the Impossible Project which successfully saved production of Polaroid SX-70 and 600 Integral Instant Films has stepped up and is trying to work with Fuji to save production of FP-100C color pack film, the last surviving pack film to be manufactured. Even if you don’t own one of these cameras, or have ever used one, you can help keep the memories alive. Visit savepackfilm.net and learn more about his efforts, sign the petition, and share this on your social media feeds. 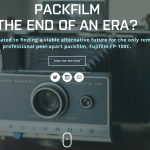 If enough people speak up, pack film can be saved. Outage is Over – What you need to know! For most, Tuesday’s Iris outage is over with some experiencing a few minor, lingering issues. IrisByLowes has released an impact statement with some very helpful troubleshooting information for anyone who is still experiencing issues with their system. On March 8th at approximately 3:00 PM EST the Iris platform experienced a database failure due to a process issue which has since been corrected. As a result, the database was restored from information saved up through March 7th at 10:00 AM EST. This restore completed around 4:00PM EST on March 8th. ISSUE: Any change made to your Iris system after March 7th around 10:00 AM EST until March 8th 4:00PM EST was lost. This includes, for example, added devices, new or changed rules, settings changes made to services like Security. RESOLUTION: We are working to restore any accounts which were added in this timeframe along with their hubs and devices. This is only possible for accounts which haven’t been re-created by the user since the 8th. This includes those who migrated from the previous version of Iris. This is expected to be done during the day of March 10th. For those existing users who added or modified a device, rule, scene, person, or changed a setting on a Service these changes will need to be manually redone. ISSUE: Several customers had their settings for Services (e.g. Security or Climate) return to default settings. Symptoms of this would be your thermostat changing mode to Auto with a default schedule in place or the entry and exit delay of your Alarm returning to 15 seconds. RESOLUTION: While we continue to investigate restoring your custom settings automatically there is not ETA on this and it is recommended you manually reconfigure your services to your preferences. ISSUE: Rules were not able to be edited from the mobile applications. RESOLUTION: This was resolved for most all rules on March 9th. The resolution for fixing the remaining rules is expected on March 10th. ISSUE: For some customers default rules for Smart Buttons, KeyFobs, and Pendants were recreated. This did not remove any existing rules. RESOLUTION: These extraneous rule were removed on March 9th. ISSUE: Pin codes for most users did not restore correctly on March 8th. This means that most users pin codes will not work for the keypad or door locks. Also if you had people in your access list for door locks it is likely they were removed. RESOLUTION: Pin codes have been restored as of morning of March 10th. We are working toward restoring the access lists for your locks once the pin codes are restored however there is not specific ETA. It is suggested you manually recreate your Access list for your locks. You may also fix your pin code manually by changing it from the side menu in the application. ISSUE: There are reports of some devices for a moderate number of users showing as online but are not controllable and do not respond to a rule firing or a schedule. RESOLUTION: This is being investigated and is targeted to be resolved on March 10th. If you are experiencing an issue not listed here, please send a detailed email to IrisSupport@lowes.com with what you are seeing. Please know that while we may not respond we are monitoring each email and are working hard to address all issues which are reported. We have confirmed that stability has again been achieved. Please attempt the recommended troubleshooting steps before reaching out to support for assistance. This has been a rough week for everyone involved and we want to extend our sincere appreciation for all of the hard work and long hours that the Iris Team must have put in to recovering from this unfortunate incident. 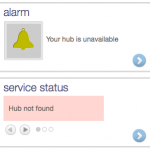 Iris Outage – What you need to know! If you are having a problem logging into your V2 Iris system you are not alone. We have been alerted by the Iris management team that there is in fact an outage that is currently affecting the system. The outage is affecting different users in different ways. Some users are able to log in, other cannot. Those who can login are missing things such as devices, history, or are experiencing odd or unexpected behavior. Please do not call Iris support for assistance, they cannot help until all systems are back online. The best course of action is to sit tight; avoid logging into the Iris app and wait for the engineers to fix the problem. Do not attempt to fix any issues yourself; do not re-pair devices, change rules, or make any other changes. Here’s a list of issues we are experiencing on our own system. Devices: Any added/changed in the past 24 hours or so are missing. Rules: Any added/changed in the past 24 hours or so are missing. Rule pick lists not working. Scenes: Any added/changed in the past 24 hours or so are missing. Climate: All devices except thermostats missing. History: Not updating right now. Home & Family: All fobs lost all associations with people. On March 8th a portion of the Next Generation platform experienced an issue. Reverting to our most recent backup resolved this issue. Normal recovery processes can take several hours before full system functionality returns. Until then, it is possible you might experience some abnormal device behavior. Please refrain from troubleshooting your system for the time being. We sincerely apologize for any inconvenience and appreciate your patience as we work through this resolution. – Users are still unable to edit existing rules. This is expected to be resolved by no later than EOD March 9th. – Some users may have experienced their pin codes no longer working or a loss of authorized people on a lock. This is under investigation for resolution and can be manually repaired by resetting a pin code and/or re-authorizing a person on a lock. – Users who added an account or devices from 10:00 AM EST on March 7th through 4:00 PM EST on March 8th may not see their new device or account. We are working toward a resolution for this and will continue to provide updates. – A small percentage of Smart Buttons and Key Fobs may have re-created their default rules (for example a Smart Button triggering a Panic Alarm). We are working to remove those by EOD on March 9th. In addition to the official statement, we have found that many devices are not controllable at this time. It is likely there are other issues that have not been directly addressed in their update. Through our own testing, we have also learned that this Iris Outage is causing spontaneous alarm activation to occur without any external trigger. We we will continue to post updates as more information on this Iris outage is available.